After all the anticipation, build up and seemingly endless waiting around the wedding was over. The marquee had started coming down before the bride and groom had left it for the final time. The next stage of our trip was due to begin at midday with the arrival of a minibus. Against all understanding, experience and Indian custom the bus was almost three hours early. Having all expected a standard slow start it was a rush to get washed, packed, fed so that we were ready to go as soon as possible. It was, of course, close to noon by the time we were actually ready to go, we said our goodbyes and piled on to the bus. The plan, oh the plan. Did we ever have one? I don’t know. New Delhi-Agra-Jaipur. Agra-Jaipur-New Delhi. Somehow we settled on Jaipur-Agra-New Delhi via New Delhi. A good number of our party had made separate arrangements for tours, sight-seeing and the like. Then of course, there were problems with the bus. It wasn’t quite big enough for us so we had to go into the city anyway to get a new one and drop everyone else off before finally hitting the road to Jaipur. 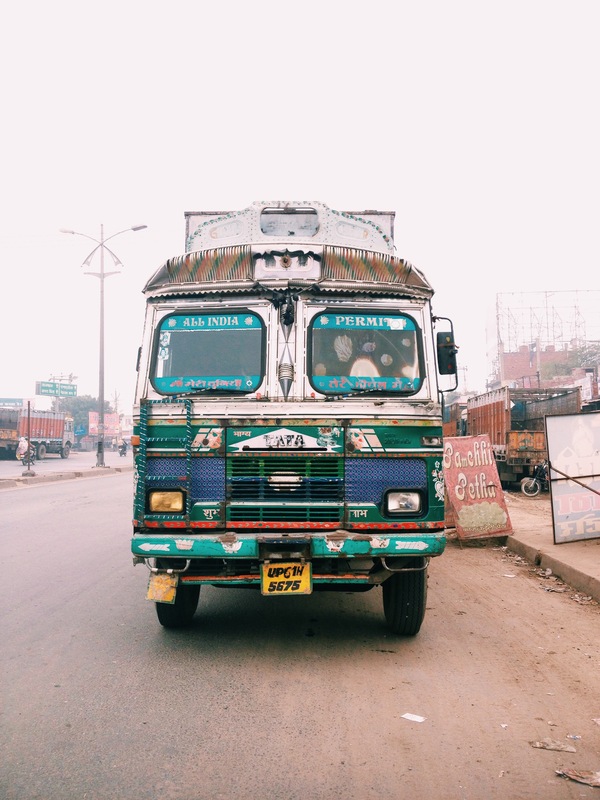 On the road again in India. How anyone knows what is happening is beyond me. In size order I have seen goats, sheep, pigs, children, bicycles, motorcycles, cows, buffalos, horses, carts, cars, camels, vans, elephants and lorries, the biggest lorries I have ever seen, all attempting to navigate the completely ignored lanes. There’s a sign on the side of the road that we’ve passed several times. “Lane driving is sane driving.” Nobody cares. At one point on the way out of New Delhi the road spread across ten marked lanes in each direction. I think I’m probably greatly relieved that I slept for most of the journey. Waking up in a dense traffic jam surrounded by these huge brown shipping containers that are attempting to merge into the lane that I suppose we are in. It feels like it’s only going to be a matter of time before the trucks on either side of us crush us between them like an empty can. Then, all of the sudden, the road opens up, everyone begins to move freely. An intersection has been the cause of our hold up. The drive passed quickly for me as I slept on. Waking up for a service station, the state border which made for a lengthy delay. I’m still somewhat confused by these giant countries whose states have their own laws. Our bus apparently needed to be taxed for the time it would be in Rajasthan. According to our most excellent driver, Raj, this had already been arranged but whoever had bought the new bus from the depot had forgotten to bring the necessary paperwork. We would have to be wait for them to be faxed through. Yes, apparently there are still fax machines with a purpose beyond transfer deadline day jokes on the internet. The air on the bus was thick with heavy breathing, sighs and sporadic comments on efficiency before Raj returned, papers in hand and we were back on our way to Jaipur. The next time I woke up we’d be closing in on the city, passing the Amer fort which immediately made it to the top of my to-do list. 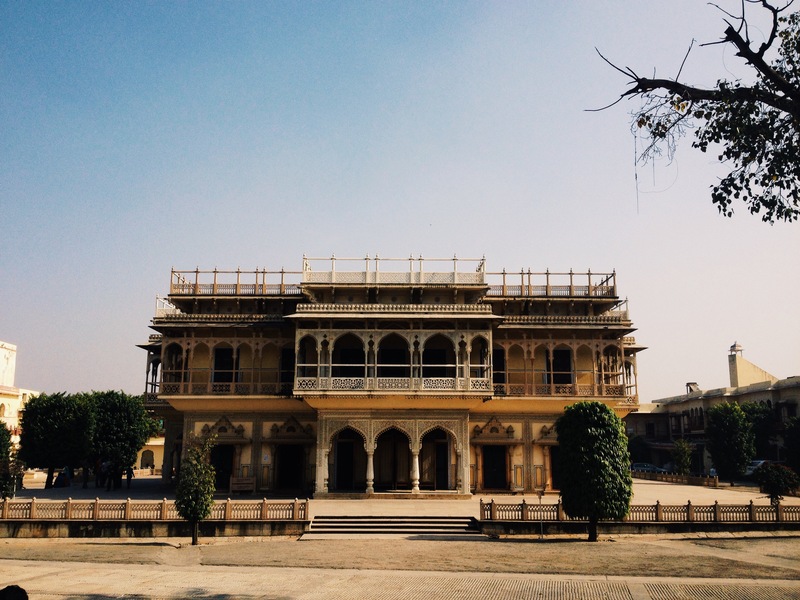 Jaipur already felt like a more pleasant city than New Delhi. Not literally a breath of fresh air mind, everything still stank of cow but the place looks cleaner, more organised, there’s more pride here. Perhaps New Delhi just offers a really bad first impression. When Elena and I stepped into our hotel room I think both of our faces must have lit up like it was Christmas. It was warm. I don’t think I’ve ever actively chose to travel in a country when it’s been winter before now with the exception of one ski tripp and one camping holiday with my family for the New Year that I can hardly remember. Layers came off immediately.A shower head fixed to the wall with the obvious potential for hot running water lifted our spirits further. It was breakfast that would complete our change in fortune. Eggs. Five days without eggs had probably been the greatest challenge for me. It was a tough run but we’d made it. Clean, fed, almost well rested it was time to get back on the bus for a relaxed day of sight seeing in the city. 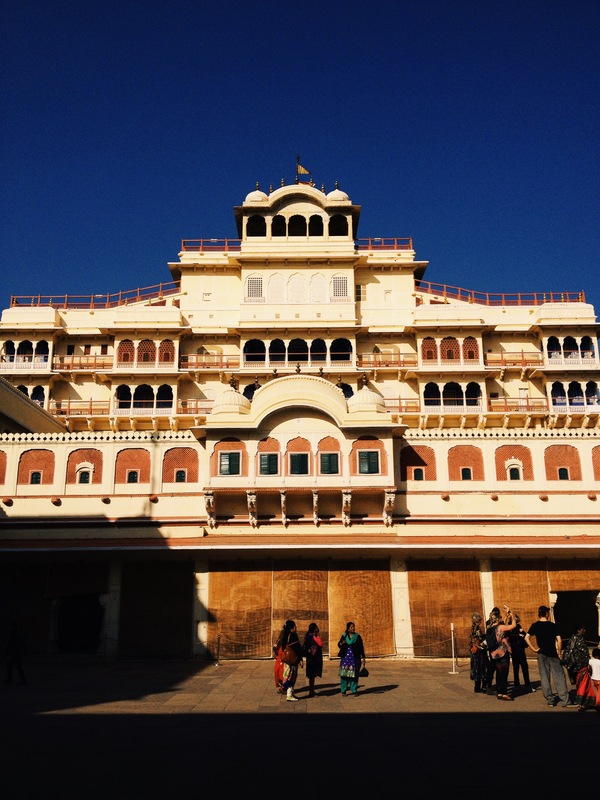 We had a short hit list that began with the city palace. 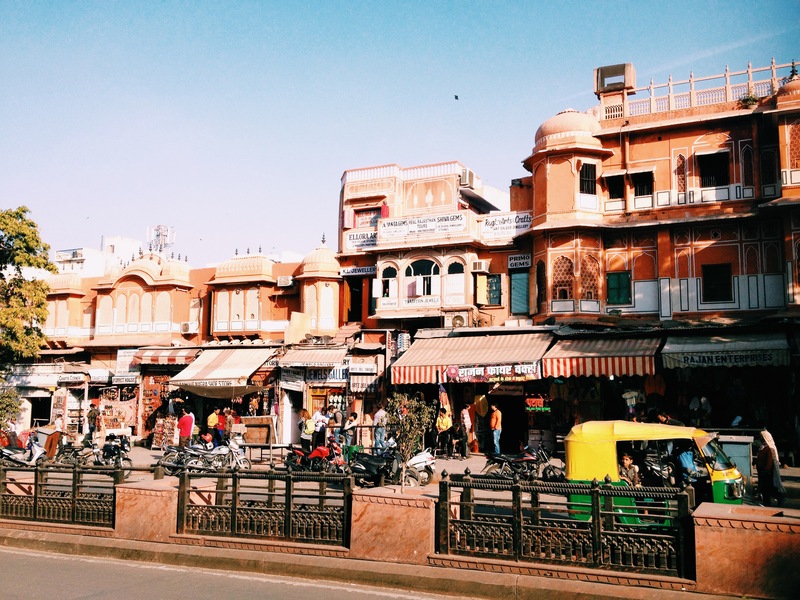 Jaipur’s famous pink city is at it’s heart, like an old walled town. Passing through the orange rather than pink gates, almost every building was the same colour. The walls appear to have carved arches and alcoves but a closer inspection reveals they’re just painted on. The city palace itself is yellow which was just a little unexpected. On picking up our tickets, there’s no pretending in India that you don’t pay more if you’re a tourist. Two ticket types, foreign national and Indian. I’ll leave it up to you to decide which is four times more expensive. The first thing that we saw was scaffolding. Less than a minute in and I’d already mentioned that it wasn’t finished yet. How very typical of a sight straight from the guide book. Men were precariously balancing on bamboo poles without platforms painting one of the buildings. Risk assessments don’t exist in India. We slowly ambled through the palace grounds, courtyards opened up beyond intricately decorated gateways filled with huge ornamental doors. The buildings within had become museums, galleries or gift shops, all containing their fair share of unusual artefacts. 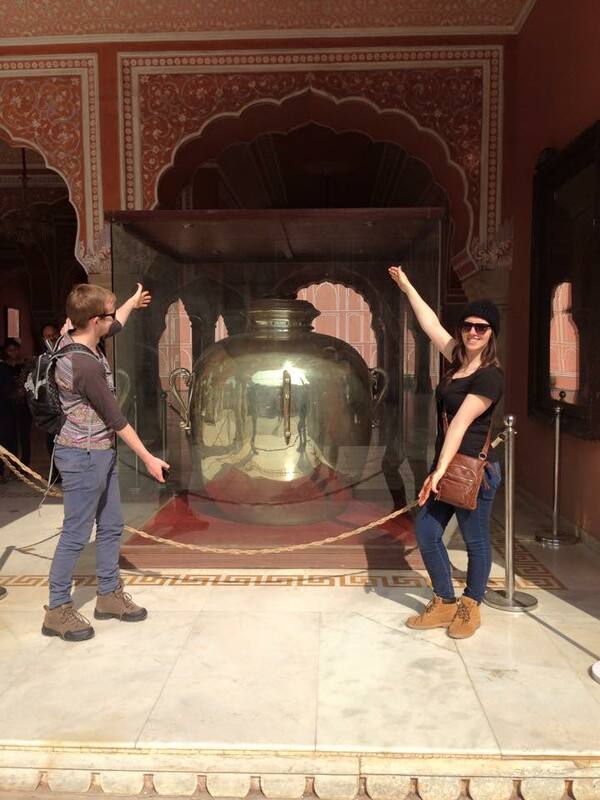 Massive jars made from silver coins that took water from the Ganges to a jubilee or coronation in England. A chandelier with a framework of hooks and rings that inspired us to discuss it’s possible functions. Decorative curtains, cleaning, public executions, who knows? There was some education to be received here as well. Billiards was a popular athletic pursuit in the past. I suspect that may well be the first time you’ve heard of billiards described as athletic. There was even a billiards-paling uniform on display. Around the palace we were treated to our first glimpse of monkeys. It hadn’t occurred to me that we’d see any at all, especially not in the city. I’d kind of assumed they would be out in the forests or something. We took lunch at the palace cafe, cold samosas where the main focus was on the plates made of leaves rather than the quality of the food. Lounging in the sun, enjoying our first slice of appreciable weather since we’d arrived. Most of us were already reminiscing over the layers required for warmth in New Delhi and Sisana. We swung by the main gallery to find a bazaar of gifts. Having already been made very much aware of the obvious price hikes for tourists in this place, everyone held off on any souvenir shopping until we were out on the streets. 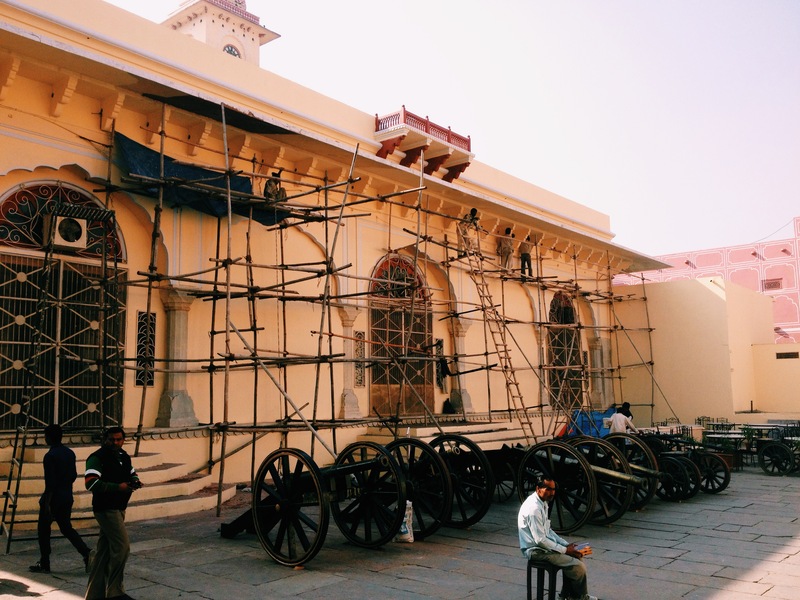 Before the palace court itself there was the armoury collection, home to an array of guns, dangers, archer rings, tiger claws and back scratchers. It was however the men in the room who were most fascinating. The ticket inspector gestured towards Elena on my entering, asking if she was my girlfriend before offering his approval that she was very nice. This was to be the first of Elena’s many admirers in Jaipur. I’m sure if it pleased her she could have done very well for herself in these parts. The other characters of note in the armoury where what I had assumed to be security. A couple of guards asking people’s nationalities and then asking for any coins. Puzzling. If collectors, they must have had many duplicates and I’m fairly certain that you can’t exchange coins so I don’t think they were making an easy tip on the side. Perhaps it was just a way to pass the time and keep them amused. The palace court was a great spot. Four beautifully decorated gates provided the access, the most popular being the one that had been designated as the entry point, the peacock gate. By now we’d probably all had enough f looking at old things, silliness began to trickle in, poses with tiny doors,surprises when men would pass through them, disrupting the fun. 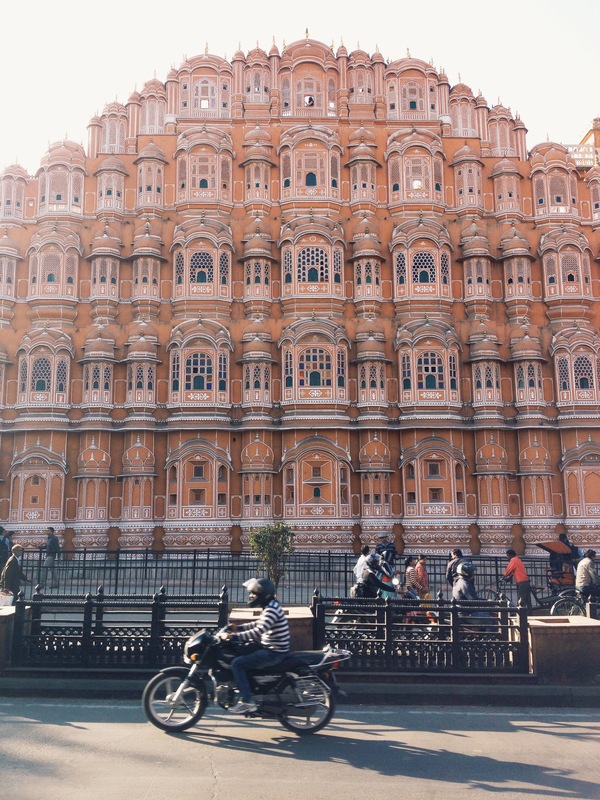 A short walk from the palace, depening on how many of the shop keepers managed to persuade you in to have just a little look at their wares, would be the home to one of Jaipur’s most impressive attractions The Hawa Mahal. Built for the royal women so that they could oversee the goings on in the streets below without being seen. It’s a giant facade of small grated window boxes, It’s a subliminal piece of architecture. Once back on the bus to finish the day, we made a short stop along the way to the hotel for Tamsin’s grandmother, Norma, to have her hair done. I briefly toyed with the idea of having a wet shave while we were there, but decided against it. Immediate regret. Come on, Chris. You know better than that. Regret the things you do rather than the things you didn’t. Gary had gone for the shave and a haircut, it looked liked he’d had a fantastic job done as well. A face massage, two passes with a straight edge. It sounded dreamy. Our day ended with a drink in the hotel bar before walking to one of the local restaurants. Beyond the curries, which are frankly a little basic. Tomatoes, onion, garlic, all manner of spices topped up with chickpeas, lentils, spinach, paneer or cottage cheese and the varieties of breads. 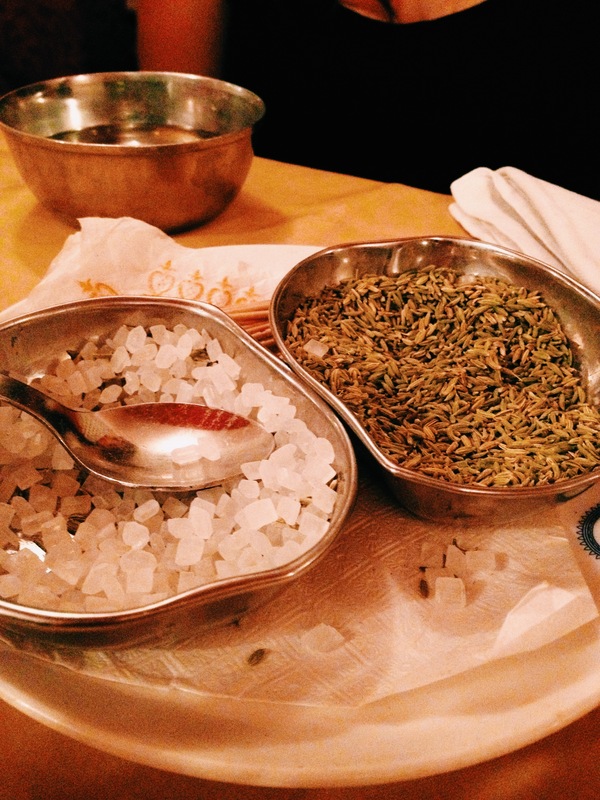 I’ve discovered something even greater that is apparently available at all good Indian restaurants around the world. The palate cleanser. Sugar cubes and fennel seeds. Tip a little of each into one hand. Put hand to mouth. Chew. Swallow. Enjoy.